Cat Tree Aruba features posts with an especially thick diameter of 11 and 18 cm and are wrapped in very robust sisal. Its three thick pillars make this cat tree especially stable so that toppling over is practically impossible. 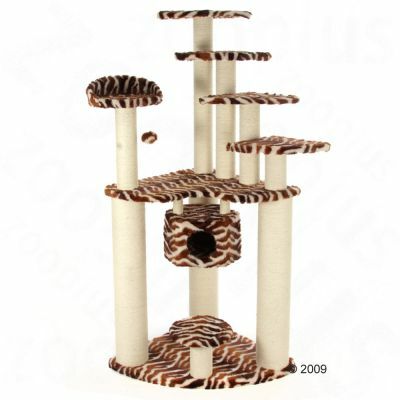 Your kitty will be able to play at its heart´s content on the 8 levels of the Aruba Cat Tree. A variety of platforms and a large cuddle den offer plenty of choice for playing scratching and snoozing. Measurements H 200 x L 76 x W 76 cm Triangular base 75 x 75 x 75 cm Platform round Ø 20 cm Sleeping den Ø 38 cm x H 25.5 cm door Ø 16 cm Platform level 2 75 x 75 cm Platform round Ø 36 cm border 10 cm 4 sitting planks 35 x 35 cm 11 sisal posts 3 pc. à 100 cm Ø 18 cm 1 pc. à 94 cm 1 pc. à 71 cm 2 pc. à 48 cm 2 pc. à 25 cm Ø 11 cm 2 pc. à 15 cm Ø 5.5 cm This product cannot be delivered to Northern Ireland. Go-Cat Senior helps tackle the signs of ageing with a formula that addresses a senior cat's specific needs. Easy crunch kibbles recognise that your cat's teeth may not beas strong as they were. Key ingredients include rice for digestive efficiency andweight management and chicken as an excellent source of high quality protein. Go-Cat Senior supports your senior cat?s immune system. Cats love catnip - once you´ve shown your pet one of these cute play bags you might have trouble getting it back! The sturdy material stands up to even the sharpest claws for even more hours of frenzied fun. Please note As with any other product please supervise your pet with this toy. Check the product regularly for damage and replace the toy if it is damaged or missing any pieces to avoid potential injury to your pet. Note One of the three designs will be delivered but cannot be chosen. Site & domain may be for sale, please contact us.